Thanks – I am still working on adding more material – the more there is the more useful the site will be. Please let me know if you have ideas on what else to add. How can i see this material? I cannot openit. .. I cannot open the material too…it’s not online yet? can you kindly tell me how to see it? it would be VERY useful! Thanks a lot! I first created the banners and I am still working on the contents. By the end of September I will have the list of kanji ready ready and the vocabulary probably end of October. I cannot open the page-list of study materials for n3. can you please help me? I am still in the process of adding material to the site after creating the banners and text for the links. Unfortunately it will still take some time until I can complete the material for N3. i am currently creating the kanji list for N3. i m not able get any of it,s link . is it working………. Sorry for the long wait. We are currently still working on it. Please be patient and keep on checking for updates on Nihongo Ichiban. How can i see this material? I cannot open it. ..please help………. Sorry many of you are asking for updates on the N3/N2/N1 materials, we are currently working on it but it takes lots of time to update these. I apologize for the inconvenience but thank you for your message and please keep on checking the website for the updates. I would like to know what study material is available online for JLPT N3 level till date for download? You can not open it because it is not yet a link. We are working on this page and hope to make it available soon. Please update N3 material as soon as possible……your materials are very useful….. It is still under construction. As each JLPT level has more vocabulary and kanji and takes us more time to create the material. Really great site. thank you so much for your effort. Yup! waiting for N3 materials!! 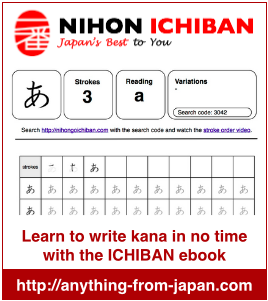 We are working on it, but the lists will only be added after we created all pages for the JLPT N3 kanji – and there is still some way to go. But thanks for visiting our site. Thank you for addressing my concern, sorry to have been a bit aggressive. I appreciate the scope of things and the massive work done on other parts of the site, there IS a ton of material here and yes it’s all done as a labour of love and born from hardwork. I wasn’t aware of the full FULL scope of it (15,000 pages) and realise that there are bound to be blind spots. Am I able to edit my previous comment to not be such a douche? I apologise, passion can be an awkward beast. But for now, take your time. I still have years to learn. Hi.. I would like to buy the flashcards for N3 and N2 level but it’s out of stock. How can I avail of this product? It seems very helpful and I would like to have it. I am not able to open any of the links. the links aren’t available for any other kanjis.